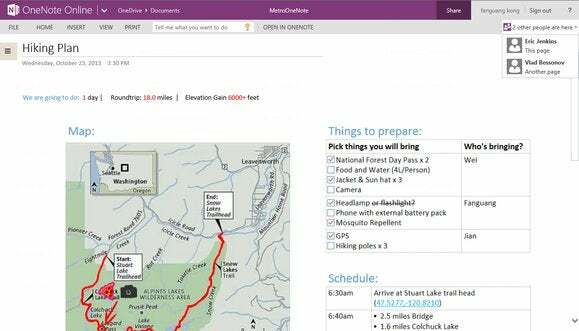 Microsoft has announced some improvements to the collaboration tools in OneNote Online, the web-app version of Microsoft's note-taking suite. The news is cause for joy, as OneNote's collaboration chops were relatively limited up to now. On Wednesday, Microsoft announced a new feature called People Presence that lets you see who is working on the same notebook as you. The company also said syncing has improved so that changes are reflected to collaborators in "nearly in real-time." The new features are visible for OneNote Online users even though they still don't work for other OneNote platforms. For example, if Jane is using OneNote Online while her colleague, Joe is working in the same notebook on OneNote for the iPad, Jane will see Joe's presence, even though Joe can't see hers. People are present, but where are they? The People Presence feature in OneNote Online. Whenever multiple users are working on the same notebook, OneNote Online users will see a drop-down menu in the upper righthand corner that lists the other collaborators currently viewing and editing the notebook. Going back to Jane and Joe, Jane's message would say, "Joe is also here." If Jane clicks on the menu, she'll see whether Joe is working on a different page or on the same page as she. When Jane and Joe are on a different page, however, OneNote online does not offer a quick way for Jane to navigate to the exact page Joe is working on. It's up to Jane to find out from Joe, or click around until she finds exactly where he is. Jane might instant-message Joe to find out—but not from OneNote Online. People Presence lacks an instant messaging component. You can't click the name of a co-author and initiate a chat. People Presence is just what its name implies: a simple notification tool for seeing who else is working on the same notebook as you. This lack of IM highlights one of Office Online's major shortcomings. Going back to Joe and Jane, if they wanted to chat, Jane could open OneDrive.com in a separate browser tab, and from there open the online messaging tool. A few seconds later an IM window would open inside of OneNote Online as well as OneDrive. For some reason, only the OneDrive dashboard and Outlook.com allow you to open Microsoft's online chat component. Just as we noted the last time we looked at Microsoft's Office collaboration tools, going back to OneDrive or Outlook.com to open the IM feature is an unnecessary extra step that slows down collaboration. Once you do get the IM window inside OneNote online open, however, you will see your fellow collaborators only if you are already connected on Microsoft's IM tool. The mere fact that two people are working on the same document is not enough, it seems, for Microsoft to connect two people for a one-time chat. That's a markedly different approach from Google Drive, which lets all collaborators chat inside Drive apps such as Docs and Sheets. Microsoft has definitely sped up its OneNote syncing, and calling it "nearly real-time" is about right. Testing out the new syncing with two users on OneNote Online, changes took five seconds or less to appear—not quite real-time, but definitely an improvement over OneNote's syncing chops before this. In the coming months, it would be nice to see Microsoft bump up the People Presence to a first-class IM experience and continue to tweak OneNote Online's syncing to get closer to actual real-time edits.